If Middlesbrough – or Port Darlington as it was – is a 19th-century industrial pioneering venture based on iron and eventually steel, then we also have evidence for the very first pioneers in our landscape after the last Ice Age. 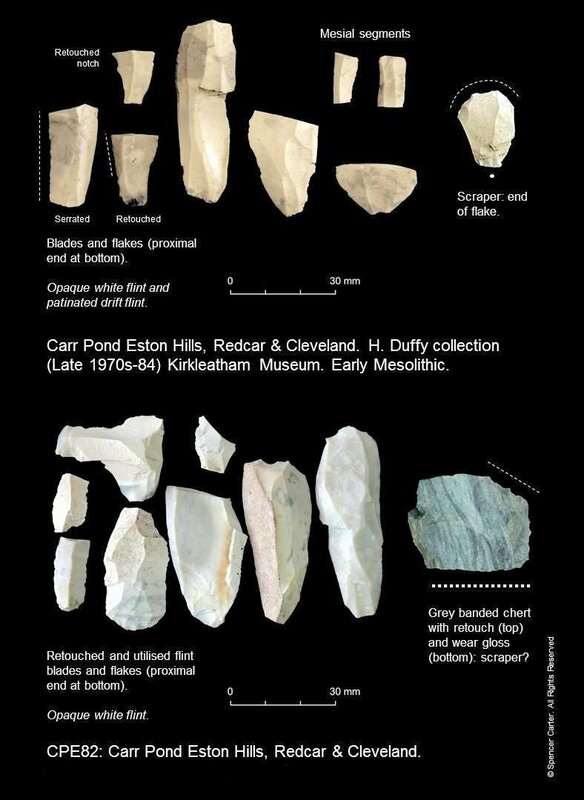 Flint tools dating back to at least around 8500 BC, or even earlier, have been found and carefully recorded from places like the Eston Hills, Greatham Creek, Highcliff Nab and along the mid-to-upper reaches of the Tees and Swale. This could have been the Vale of York around 12,000 BC during the last Ice Age, Pennines left, North York Moors right, Teesside notionally top right distance. Wikicommons. While it is possible that people were here before the last great Ice Age, which ended about 12,000 years ago, the glaciers and rising seas since then have likely scoured away most traces. That said, there has been a human (hominin) presence, off and on, in the place we now call Britain for almost a million years (including the oldest footprints outside Africa, off the Norfolk coast at Happisburgh), with firm evidence for people just like us visiting Scotland across a land-bridge that joined us to the continent until the eighth millennium BC. One might argue that many innovations began in the North! 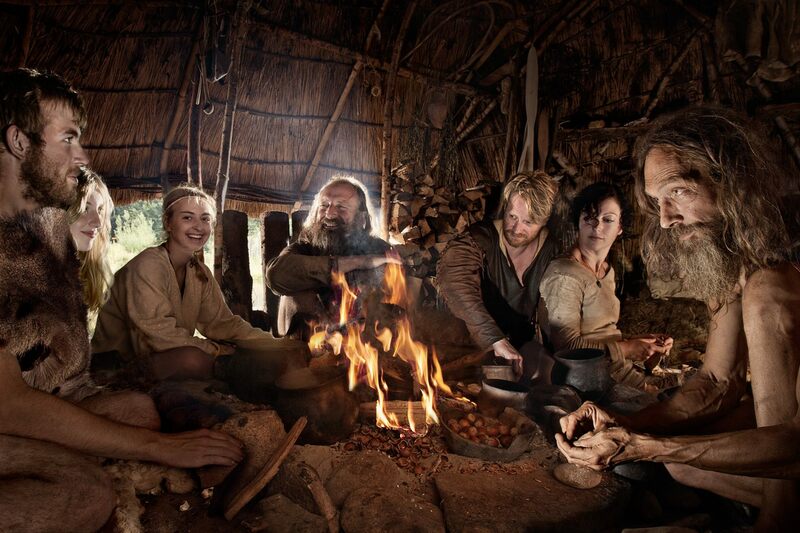 Mesolithic chatter over roasting hazelnuts, sometime in the autumn about eight thousand years ago. © Frank Wiersema. As the climate warmed rapidly, the first pioneers returned to our landscape – hunter-gatherer-fishers – and left traces like their stone tools. These mobile folk chased the game and exploited every conceivable resource in their midst. Rare sites which still have organic survival, like Star Carr near Scarborough, offer insights into a socially rich and complex lifeway. This Mesolithic period lasted over six thousand years until the advent of farming, monument building, domestication of crops and animals, the very first pottery and settlements in a very short transition period around 4000-3800 BC, literally a few generations. Island Britain as we know it today is a relatively recent situation. 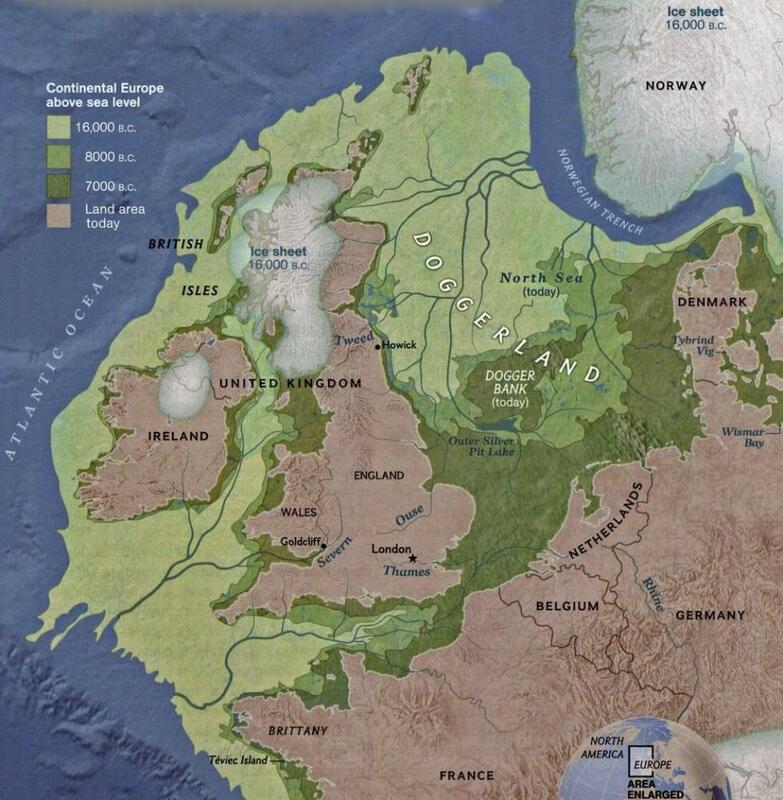 Warming climate and rising sea levels eventually drowned Doggerland and our land bridge to continental Europe. © National Geographic. 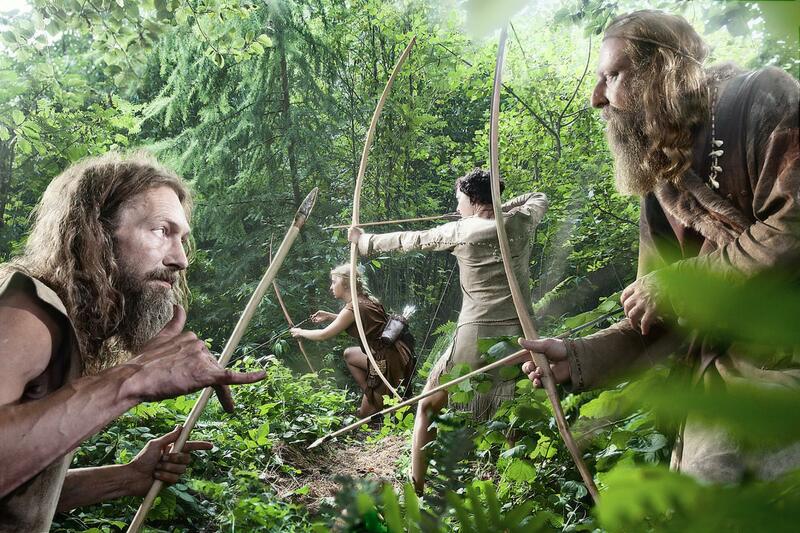 The Mesolithic had been a period of major climate change too. It was generally a little warmer than today at its optimum with a densely wooded landscape, except for a rather nasty cold snap around 6200 BC. Rising sea levels and a terrifyingly destructive tsunami, the Storegga slide around 6100 BC, finally cut island Britain off from mainland Europe. Doggerland was drowned. Hunting in the Mesolithic. © Frank Wiersema by kind permission. Evidence for climate change is emotively revealed from time to time at Seaton Carew (Tees Archaeology monograph) and Redcar when Mesolithic and Neolithic prehistoric forest remains, and occasionally artefacts that include a Late Mesolithic fish-trap, are exposed at low tide and after storms. 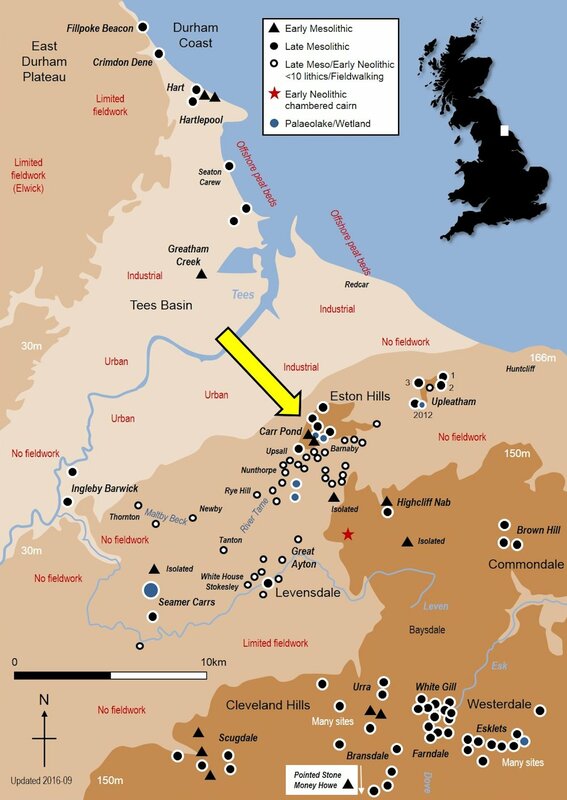 Mesolithic and Early Neolithic sites in the Teesside area. © Spencer Carter. The majority of Mesolithic and early Neolithic finds have traditionally occurred in the uplands, largely today’s North York Moors at around 300m elevation, as well as the Upleatham Hills. To some extent, and in a heavily forested landscape for the most part, this may be a combination of reality but also biased by erosion, peat fires and flint collecting habits in the 20th century. Recent work, as part of a community project, at Levensdale between Stokesley and Great Ayton produced a multi-period flint assemblage that included Late Mesolithic artefacts near the original course of the River Leven. We know that watercourses were routes for movement within the wooded landscape. What’s more, we now have more than hints of Late Mesolithic to Early Neolithic activity in the lowlands around Nunthorpe and Upsall. 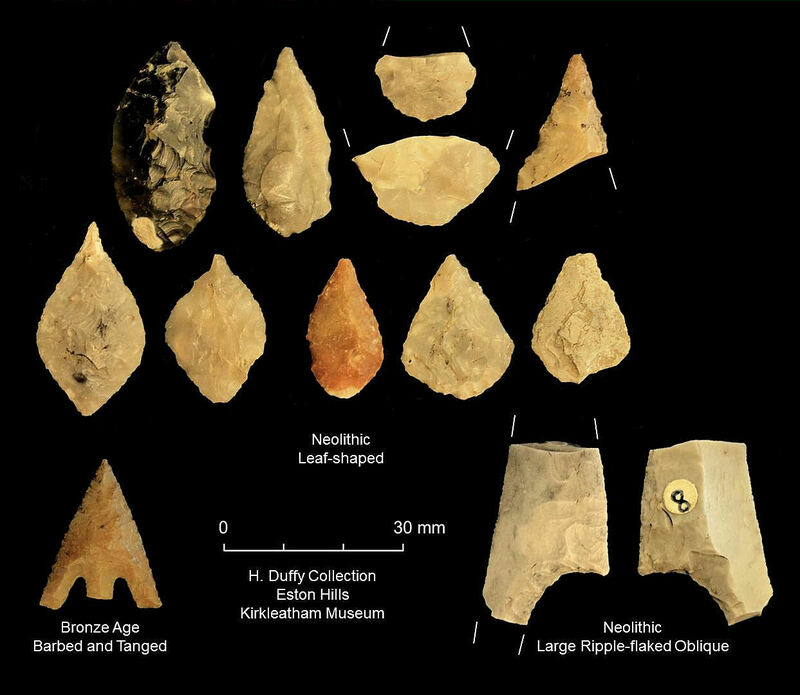 Systematic field-walking and recording of lithic finds – in the process of analysis – indicate that the entire landscape was exploited and that ‘gaps’ in distribution maps are more likely related to fieldwork biases and agricultural regimes. Given that we also have a wetland at Morton Carrs, although affected by a 1980s waste tip and field drainage, this area holds great potential for understanding upland and lowland ‘taskscapes’ through time. 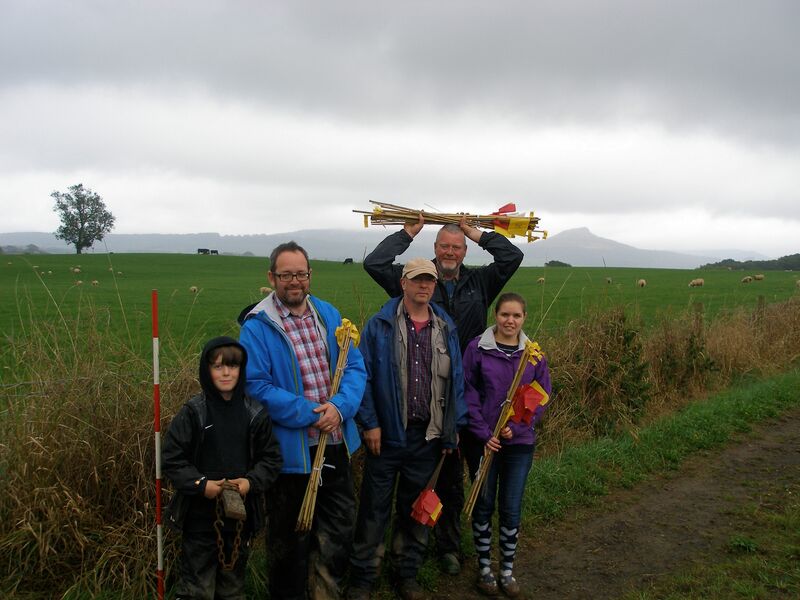 Some of the field-walking volunteers whose eagle eyes have recovered prehistoric artefacts around Nunthorpe and Upsall – Noah, Peter, Bruce and Beth. © Spencer Carter. 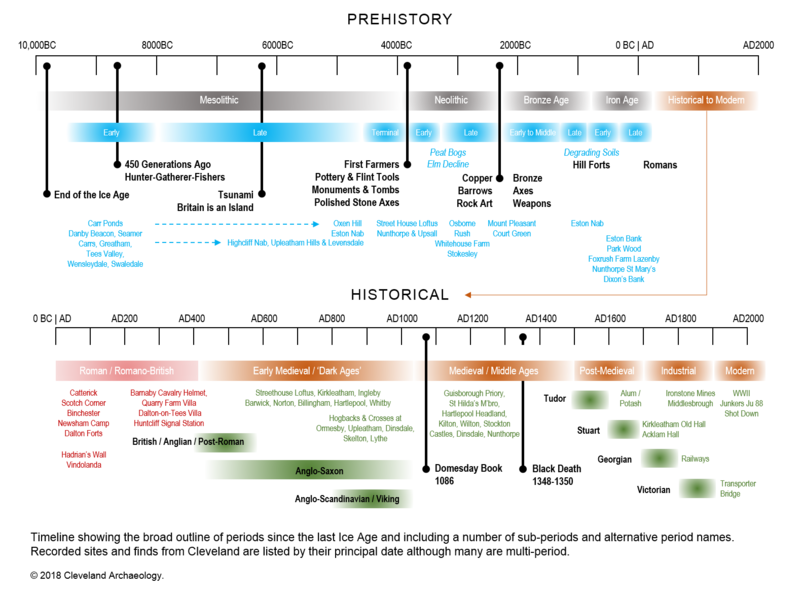 Whether the Neolithic saw the arrival of new settlers and domesticates from the east, or the know-how and ideas – likely a complex combination – remains somewhat contentious and fascinating, augmented by our recent ability to look at human and animal DNA, diets and mobility using leading-edge scientific techniques. Equally fascinating is the period around 4000 to 3700 BC where hunter-gatherers and farmers integrated. Moreover, if anybody had suggested, say 30 or 40 years ago, that we would find any more than a few flint arrowheads and polished axes from East Yorkshire and Cumbria, and an enigmatic chambered Neolithic tomb on Great Ayton Moor excavated by Raymond Hayes in the 1950s, there would likely have been an uproar of laughter. By the way, there’s a Neolithic 5000 year-old flint arrowhead from St Hildas, Middlesbrough, flint tools from the vale of Guisborough, and around the course of the River Leven and its tributaries. They were here! 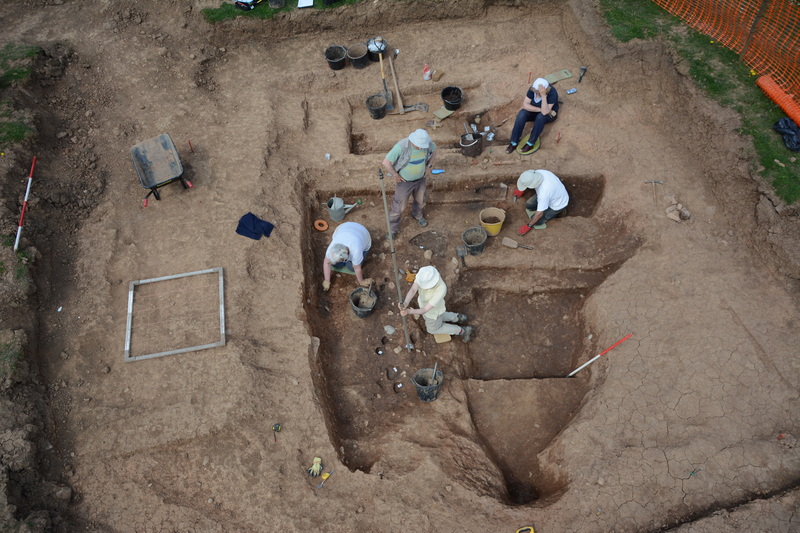 2016 excavation of a Neolithic house, under very much clay, at Street House, Loftus, dating to the early fourth millennium BC. © Stephen J Sherlock by kind permission. We now have firmly radiocarbon dated evidence for ‘Teesside’s oldest house’ at Street House, Loftus (East Cleveland), with flint tools and very early pottery (joining a mortuary cairn discovered in the 1980s) dating back nearly six thousand years, 3700-3900 cal BC, and sitting under a metre of heavy clay (Northern Echo 2016). Recent developer-led work near Stokesley also adds one of northern England’s most substantial later Neolithic grooved ware pottery assemblages, dating to the early third millennium BC, and not inconceivably associated with brewing. Beer is not a recent concept. Early Neolithic Grimston Ware pottery − the first pottery in Britain. Buxton Museum, Derbyshire. © The Modern Antiquarian. Street House typifies the archaeological potential of our region as a whole. It demonstrates continuous human activity from the Mesolithic through the Neolithic, with Bronze Age and Iron Age settlements, a Roman farmstead whose occupants were cannily trading in salt and Whitby Jet objects, to the extraordinary Anglo-Saxon royal princess buried in a jewel-festooned bed in the seventh century AD (Kirkleatham Museum, Redcar) – an internationally important discovery. As an outlier of the North York Moors, the Eston Hills provide a similar microcosm, a canvass for over ten thousand years of human endeavour. LiDAR (laser) image of the Eston Hills around the Carr Pond wetland area and Oxen Hill. 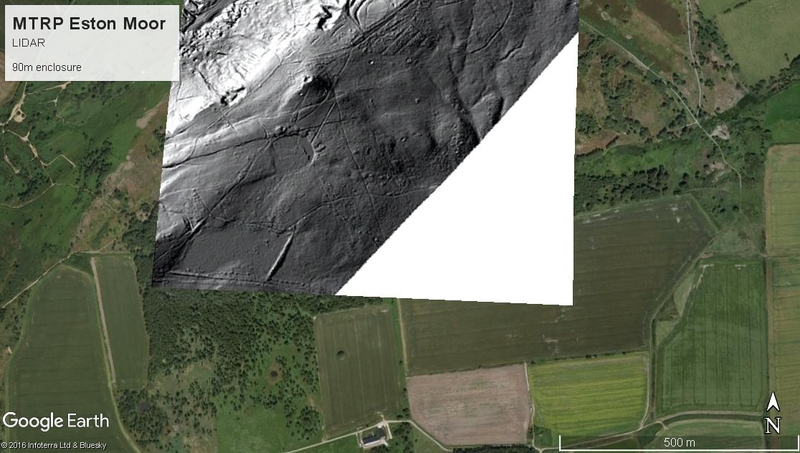 The Early Mesolithic site appears to be a peninsula in the wetland area, bottom centre of the black-and-white inset. Fieldwork will involve taking a pollen core sample from the wetland to establish the date of the base deposits using radiocarbon aging of the organic material. Image courtesy of the Mid Tees Research Project. 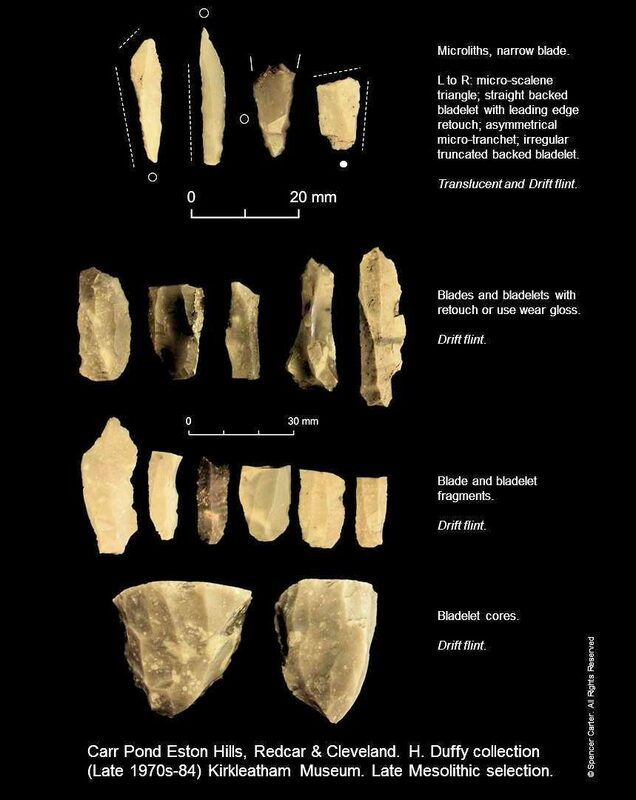 Early Mesolithic flint tools from Eston Hills, 9000-8000 BC. Duffy collection at Kirkleatham Museum. © Spencer Carter. Late Mesolithic flint tools from Eston Hills, 8000-4000 BC. Duffy collection at Kirkleatham Museum. © Spencer Carter. 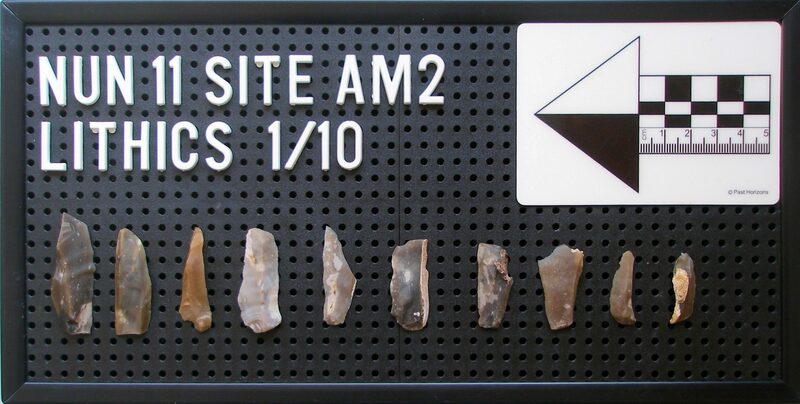 Neolithic and Bronze Age flint arrowheads from Eston Hills, 4000-1800 BC. Duffy collection at Kirkleatham Museum. © Spencer Carter.